I used to think of treadmills as the walk (or run) of shame. They were only used on rainy or cold days when I was desperate to get in my workout. But I have since wised up. Approached the right way, they can offer in-depth, all-around workouts beyond the usual push-the-button-and-go. Treadmills are also ideal for people returning to exercise after an injury or surgery, since you can control the pace and intensity, and they are equipped with handrails for added support. Most treadmills monitor intensity with hand sensors that measure your heart rate, but that’s not always the most accurate approach, says Dr. Tenforde. A better way to gauge your effort is with the rate of perceived exertion. This involves ranking your sense of how hard you’re working on a 1-to-10 scale, with 1 being low and 10 being high. For example, 5 to 7 is a moderate-intensity level where you work hard, but can maintain a conversation and not overexert yourself. Here are three treadmill routines from Dr. Tenforde you can add to your exercise program that address three areas of fitness: speed, endurance, and muscle building. Begin with a 10-minute workout and then gradually build up to 20 to 30 minutes as you progress. Routine 1: Incline (endurance and muscle building). An incline setting generates more muscle activity than walking or running on a flat surface, since you work against gravity. 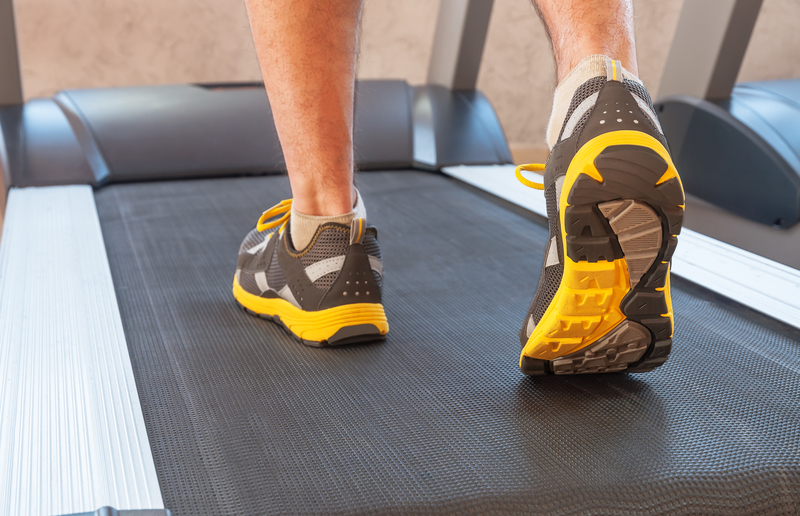 A small 2014 study in the journal Gait & Posture found that incline treadmill walking also could benefit people with knee osteoarthritis and knee replacements. The workout: Begin walking or running at a zero-grade incline at an exertion rate of 3 or 4 for up to two minutes, then increase to level 1 incline for another minute or two. Repeat the routine until you reach an incline level where you work at 5 to 7 exertion and try to maintain it for a minute or longer. Then reverse the routine until you reach the zero-grade incline again. It is fine to stay at an incline longer, or to exercise at a lower exertion rate, until you are more comfortable. Routine 2: High-intensity interval training (speed, endurance, and muscle building). HIIT involves alternating between set periods of high-intensity work and rest. The high intensity is at an exertion rate of around 5 to 7, while you rest at a rate of 2 or 3. “HIIT is based on your individual exertion, so adjust the treadmill to match this desired effort,” says Dr. Tenforde. “The point with HIIT is to mix up the intensity to make yourself work harder for shorter periods. It can be fun and breaks up the monotony of exercise.” HIIT is also ideal for people who have trouble finding time to exercise. A study published online by PLOS One found that HIIT produces health benefits similar to longer, traditional endurance training. The workout: Begin with a moderately high intensity-to-rest ratio of 1:3, in which you power walk or run for one minute and rest for three minutes. As you improve, you can vary the ratio to 1:2 or 1:1 or even work for longer high-intensity periods with shorter rest breaks. Routine 3: Speed variations (speed, endurance). Most treadmills have pre-programmed workouts that vary the speed and incline with labels, such as “fat burning” or “hill climbing.” “These can help increase your cardiovascular health by varying the effort and can be another way to add variety,” says Dr. Tenforde. The workout: Choose one of the pre-programmed workouts and adjust the speed and resistance as needed to ensure you stay within an exertion range of 5 to 7. I don’t understand Routine 2. There you say that ‘The high intensity is at an exertion rate of around 5 to 7’, but previously you said that ‘For example, 5 to 7 is a moderate-intensity level’. Where is the high intensity there? Which treadmill is advisable, manual or motored. Does it make a difference. Day has come where exercising is a must, it as all connected without way of life , we are lazy these days. This post gives really nice tips on how to use treadmills properly.